Custom imprinted retro sunglasses feature neon frames and dark UV400 protective lenses, which make it one reliable fashion accessory. This retro sunglass is perfect for tradeshow and party gifting because we offer exciting discounts on bulk orders. Offered in different colors , this retro sunglass is affordable and eligible for making impressions on the crowd. You can avail attractive discounts on bulk orders of these customized retro sunglasses. Avail free online design proof with all orders. 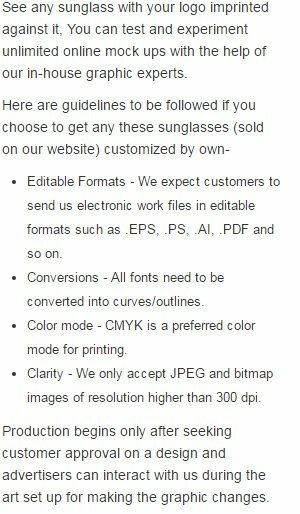 Request a quote to know discounts that you can avail for these customized retro sunglasses.